Fincher's White Front Western Wear - Dallas Clothing & Access. Fincher’s White Front Western Wear is located in the heart of the historic Fort Worth Stockyards. The huge white two-story building with the rust horse mannequin houses our western store, which has been in operation since 1902. Fincher’s stocks a full line of western wear from infant to adults. Though we are located in a popular tourist area we continue to draw true western families among our regular patrons. Third and fourth generation customers enter our doors everyday. That’s because Fincher’s carries such storied brand names as Wrangler, Cinch, Cruel Girls, Roper, Stetson, Resistol, Rockies, Justin, Tony Lama, Nocona, and Rios of Mercedes. Service is another reason loyal customers return decade after decade. There are many other western stores, but how many of them have been serving their customers the same way for a century? 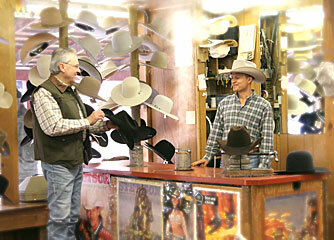 At Fincher’s we serve you the old-fashioned way, from hand-created hats to properly fitted boots. Visit this fabulous store today and return home with a whole new Western look.